#1 NEW YORK TIMES BESTSELLER • Janet Evanovich, author of the blockbuster Stephanie Plum novels, and Lee Goldberg, writer for the Monk television show, team up once again in their New York Times bestselling Fox and O’Hare series! Nicolas Fox, international con man, thief, and one of the top ten fugitives on the FBI’s most-wanted list, has been kidnapped from a beachfront retreat in Hawaii. What the kidnapper doesn’t know is that Nick Fox has been secretly working for the FBI. It isn’t long before Nick’s covert partner, Special Agent Kate O’Hare, is in hot pursuit of the crook who stole her con man. The trail leads to Belgium, France, and Italy, and pits Nick and Kate against their deadliest adversary yet: Dragan Kovic, an ex–Serbian military officer. He’s plotting a crime that will net him billions . . . and cost thousands of American lives. Nick and Kate have to mount the most daring, risky, and audacious con they’ve ever attempted to save a major U.S. city from a catastrophe of epic proportions. Luckily they have the help of an eccentric out-of-work actor, a bandit who does his best work in the sewers, and Kate’s dad, Jake. The pressure’s on for Nick and Kate to make this work—even if they have to lay their lives on the line. 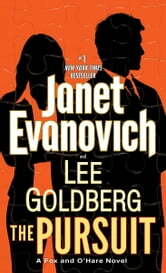 I just finished reading The Pursuit (Fox and O'Hare #5) by Janet Evanovich and Lee Goldberg and would like to say it was very enjoyable but I only gave it three stars. You really need to read the previous book The Scam. The Scam ended with an unexpected and stunning cliffhanger and I was so surprised at this that I originally thought I had a misprinted book missing its ending. The Pursuit picks up running at pretty much the place where The Scam left off. This is so true that I wonder if originally one very long book was split in two by the publisher. It is truly hard to provide any plot description that will not spoil the tension provided at the end of The Scam. Needless to say this teaming of a world famous con man and an tough female FBI agent plus members of their standard support teams end up pulling off two heists an con their way to another success. Events in The Scam cause a lack of tension between our heroes. Jake, Willie and Boyd are back to lend their expertise and that extra bit of odd levity. The problem with series books is the need to reintroduce characters with each novel. Picking up a series in the middle tends to let one lose the depth of character development that took place over the previous novels. The Pursuit has the least character development of any of the previous books. Only two secondary characters essentially originated in this book have any depth. Even our protagonists are given short shrift. This is the longest book in the series but somehow seemed the shortest of the novels. I'm looking forward to more books in the series and hope this was a blip in an otherwise highly entertaining group of books. To anyone considering starting this book I strongly urge you to read The Scam or better yet start from the prequel novellas. An easy ready. Love these characters. The storyline and series is highly addictive. A series worth every penny. LOVED this book!!! Actually, I love the whole series! It's fast paced and funny, but also very smartly written. The cons are elaborate and I love how an FBI agent is paired with a career criminal to pull off the cons. Kate is a tough and no nonsense special agent, with a father who was a military special operator. All girls want to be able to count on their dads, but when Kate calls her dad, he shows up with a rocket launcher and other fun toys. If you enjoy the genre, you will love this book. While it is part of a series, it is a stand alone novel. However, the series is so good that you really owe it to yourself to read them all.